The popular aviator saying explains that if you want to make a small fortune in aviation, you need to start with a large one. We all know aviation expenses can quickly add up, so why pay more than you must on your aircraft insurance? Living off their legacy, Avemco insurance continues to sell insurance at a higher premium on an outdated policy. Earlier this month, Aviation Insurance Resources (AIR) established a policy for a Bonanza owner who had two pilots on his policy. This individual was looking to add a third, lower time pilot who was not instrument rated. At $150,000 hull coverage Avemco had quoted their current insured just over $5,000 annually. AIR’s quotation was LESS THAN HALF that at only $2,285. Avemco is a direct writer, meaning that they set the premiums and discounts that are quoted. When you call Avemco, you are working with one underwriter and receive just a single quote. AIR is an aviation insurance broker, meaning they shop all the other major aviation insurance markets for your aircraft insurance. In most cases, AIR will receive multiple insurance quotes for your aircraft insurance. More options equal more savings, with competition within the market driving the rates down. Who offers the better policy? It is always important to read through your policy and review any questions with your insurance agent. However, the main and most important difference between Avemco and all the other markets is in one simple word. An Avemco policy is written with a per person sub-limit whereas most other policies are written as a per passenger form. The Avemco policy could be leave you short on coverage if an accident were to injure an individual outside of the aircraft. To remain competitive, insurance carriers are often increasing policy benefits while Avemco continue to use their outdated form. All the agents at AIR are pilots and understand the ins and outs of the aircraft insurance industry. When the Bonanza owner called in for a quote he spoke directly with a pilot, not just an insurance agent. A pilot calling into AIR will speak with an individual who knows the nervousness of a first solo or a check ride and understands what it’s like to transition to a new aircraft. AIR’s headquarters and branch offices are full of pilots from all walks of life, to include CFIs, rotor pilots and balloon pilots! At the beginning of this month, a Bonanza pilot saved over $2,715 simply by calling AIR. Why pay more for your aircraft insurance? Call 877-247-7767 or request a quote online today! As an aircraft owner, it is highly likely your name and address has been plucked off of the FAA database for a variety of aviation-related mailing blasts. Often it can be hard to sort through the facts and fiction sold in these solicitations. We recently received a letter from Avemco Insurance Company that we wanted to review with you. 1. Avemco still pays your covered claim even if your medical, annual or flight inspection expires accidentally mid-term. Life is busy! While most pilots are responsible, detail oriented individuals, important due dates can slip away from us. Luckily, most insurance carriers will still pay your claim in the event of an accidental lapse of an FAA requirement (such as your medical, annual inspection or flight review). That being said, it is important to remember that when you sign an aircraft insurance application you are attesting to the terms and conditions laid out, Avemco or otherwise. 2. Avemco connects you directly with an Aviation Insurance Specialist in our Frederick, MD home office empowered to approve coverage and solve problems. While Avemco connects you to a company employee, Aviation Insurance Resources (AIR) takes this a step further. Our knowledgeable agents are all pilots! While Avemco representatives can approve coverage (limited by their level of authority) on the phone, we advise an insured prior to talking to the underwriter and discuss the best course of action for your specific needs. AIR works on your behalf, not the insurance company’s. 3. Avemco can give you a personalized quote and even insure you in one phone call. Avemco can provide one aircraft insurance quote with a phone call because they have the ability to set their own rates. At AIR, we shop all of the major carriers competitive for your unique situation to provide you with the broadest coverage at the lowest available rate. We do not lock you in to just one number and one set of terms. Generally, AIR can provide you with a quote and coverage the same day and at a lower rate than Avemco. 4. Avemco lets you manage your policy, make changes and pay your premium online. While Avemco promotes their ability to change a policy online, we like to provide you with a personal touch. We are thrilled to pick up the phone and discuss your needs pilot to pilot. In the event a phone call is not convenient for you, you can expect a prompt response from one of our agents via email. We like technology, too, and offer streamlined customer service online! Many applications and forms are available on our website, including portholes to update contact and pilot history information. You can also make your payment online! 5. Safe pilots can save up to 25% on their Avemco annual premium: Save for completing a FAASTeam WINGS course. Save for getting Avemco-recognized recurrent training or a new rating. Save for having an Instrument Rating. Save for hangaring your airplane. Flying safe is beneficial to you and your loved ones, and to your aircraft insurance rates as well! Aviation insurance policies quoted by AIR may contain a combination of the discounts listed in the above Avemco solicitation. Discounts for FAASTeam WINGS courses and being claims free are available for both owned and non-owned policies! An instrument rating, new ratings, recurrent training, as well as hangaring your aircraft can offer additional savings! Several policies contain extra benefits and discounts for AOPA and EAA members that are not even offered by Avemco. Line by line it is proven that AIR can offer everything that Avemco claims, plus more! So why involve the middle man? We are pilots looking out for your interest and service with integrity is our priority! Purchasing an aircraft takes time and research. With just two phone calls (Avemco and AIR) you will be provided with all available aircraft insurance quotes from the major markets to make an educated decision. We are so confident in our ability to serve you, we encourage you to call Avemco, our competitor! To get into the air with your aviation insurance quote today, call our agent and pilots at 877-247-7767 or click here to request a quote online. To learn more about AIR you can find us at www.AIR-PROS.com, Facebook, Twitter, Instagram and LinkedIn! Soon, thousands of pilots and aviation enthusiasts will gather on the grounds of Wittman Regional Airport in Oshkosh, WI for the 2015 EAA AirVenture. Featuring over 10,000 aircraft and a daily airshow, Oshkosh is the place to be in July! Are you ready for all that it has to offer? The pilots and agents at Aviation Insurance Resources (AIR) are getting excited to meet current and new clients at friends at the world’s largest airshow. Visit our booth in Building A, #1120 to receive the best aviation insurance rate and an Oshkosh-only special offer! In December 2012, Victoria Neuville Zajko, a commercial pilot and insurance agent at AIR flew to West Virginia to adopt a puppy from a local rescue. Turbo was the only appropriate name for the pup, who took to flying right from the beginning. Turbo loves to be in the air and is closing in on 100 hours logged in flight. Inspired from Turbo’s real-life story, Zajko teamed up with newspaper publisher and friend Kelly Kennedy to create a children’s aviation book series, Turbo the Flying Dog. The first book tells shelter dog Turbo’s “tail” as he discovers he will finally have a new home and a family, but learns he must first get there by plane. Turbo has never seen a plane before, let alone flown in one, and as the story unfolds he discovers that he just may enjoy flying! 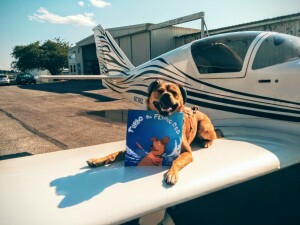 Turbo’s second book, Turbo Learns to Fly, will release just in time for Oshkosh allowing young readers to follow Turbo as he takes his first flight lesson. Victoria will be in the AIR booth with copies of books one and two from the Turbo series. She is offering a $2 discount on book purchases to those who request an aviation insurance quote during the show. Authors Kelly Kennedy and Victoria Zajko describe the book as a light-hearted adventure for children ages four to eight focused on rescue, family, and aviation. Illustrated by Michelle Zajko, the bright colors and illustrations mimic the real Turbo and his aviation surroundings. To learn more about the Turbo series, visit www.turbotheflyingdog.com. You can also follow him on Facebook, Instagram and Twitter! All agents at AIR are pilots and come from a strong background in aviation. When you call AIR, you will always find yourself talking to a person who is as excited about your aircraft as you are. Whether you are looking for flying club insurance or flight school insurance, Cessna 150 insurance or King Air insurance, all of our agents at AIR will take your needs personally as if it were their own. AIR works with all the major markets to obtain the best rates at the broadest coverage available. To save time and money on your aviation insurance please contact Aviation Insurance Resources by calling 877-247-7767 or visit AIR-PROS.com today to receive your aircraft insurance quote! You can also follow us on Facebook, Twitter, LinkedIn, Instagram and Google+. Stop by our booth at Oshkosh: Building A, #1120 to hangar fly with us! Joe Ruck (Native Floridian) recently returned home from Los Angeles back to the Sunshine State. The highlight of the trip was an evening with the folks from Cardinal Flyers Online (CFO), which is a group of Cessna Cardinal owners and pilots approximately 3,500 members strong. The evening event was held at the home of a CFO member in Winter Haven, Florida. This same CFO member has hosted this annual event for the past several years. This year approximately 50 Cardinal owners attended. CFO typically gathers at Lakeland each spring for Sun N Fun, then Oshkosh, Wisconsin the last week of July, and a Cardinal fly-in somewhere in the USA each year. Past fly-ins have included destinations such as Santa Maria, California (Wine Country), Death Valley, Bowling Green, Kentucky (Corvette Museum), Williamsport, PA (Lycoming factory), and Wichita, KS to visit the Cessna factory and celebrate the 40th anniversary of the Cessna Cardinal. Started simply as an email digest in 1997 which went online in 1998, CFO quickly grew in size becoming an incredible resource sharing all sorts of subjects of Cardinal wisdom with fellow Cessna Cardinal owners. CFO fly-ins began in 1999 and in 2000 they became an official organization which you can join for a $34 per year membership. Aviation Insurance Resources (AIR) is the official insurance broker for Cardinal Flyers Online. 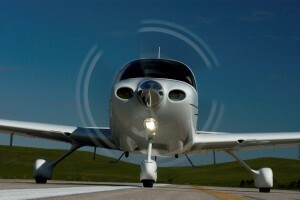 The CFO founders own aircraft are insured through AIR as well as the organization policies. AIR Regional Representative and CFI Joe Ruck heads the CFO insurance program for AIR. As fellow aircraft owners, AIR understands your needs and challenges in owning an aircraft. AIR offers a wide range of aircraft insurance options for aircraft of all makes and models, including the Cessna Cardinal. We represent all of the major aviation insurance markets so we can offer you the broadest package of protection at the best available rates. To find out more about Cardinal Flyers Online or Cessna Cardinal Insurance, please contact Aviation Insurance Resources by calling 877-247-7767 or visit AIR-PROS.com today to receive your free Aircraft insurance quote!